← French Island, The Keith Roget Memorial National Parks Award and a hike in the sun. French Island, The Keith Roget Memorial National Parks Award and a hike in the sun – it happened but not quite as planned. Saturday morning came around and I made the final adjustments to what I was and was not taking on the trip. I weighed the pack and it came in at 25 kg. This was a bit heavier than I wanted but Adam had said we would have room available to take some stuff if need be. As I headed off up the freeway to pick up Adam I got a text message from Hayden saying that he was unwell and wouldn’t be joining us. This was a disappointment as Hayden was the first to put his hand up to join me on the island trip. This also meant that the 40/80 m dipole, two batteries, an SWR meter and an IC7000 that Hayden was bringing wouldn’t be there either. Anyway, there was still Adam and Marcus coming along so it was still worth going ahead. I picked up Adam and he tells me that he hasn’t got his new camera yet so I say he can take some photos with mine instead. There is about $1500 difference in the cameras but, having seen the photos Adam took, the quality of the camera is only one aspect of a great photo. I had been warned about the mosquitoes, March flies, and sand flies but nobody had told me about snakes, until now. After parking the car we went and bought the ferry tickets. $21 to get over and back. Again we got asked what we would be doing on the island. There seems to be a common theme here. After a short wait Marcus arrived and he too went and paid for parking and then bought his ferry ticket. The ferry left right on time and we were stepping off at Tankerton Jetty 15 minutes later. Already the day had started to warm up and sitting in the ferry was not all that pleasant as it has lots of glass and no air-conditioning. We loaded our packs on and headed off toward the east. After about 800 m there is a junction with the coast road and we turn left and head north. The trip to the camp proceeded as planned and we stopped three or four times in the shade to refresh with water and re-apply sunscreen. 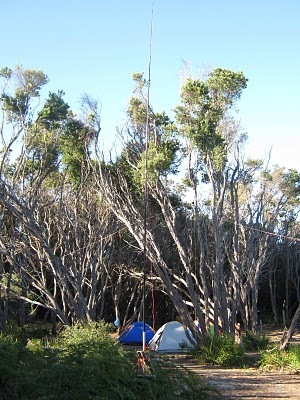 Once at the camping ground we set about finding a suitable place for the antennas and out tents. There were four main options available as some other tents had already been erected. One area to the south was quite small, covered and shaded, one area to the far north was exposed with no tree cover and two areas, side by side, in the middle. 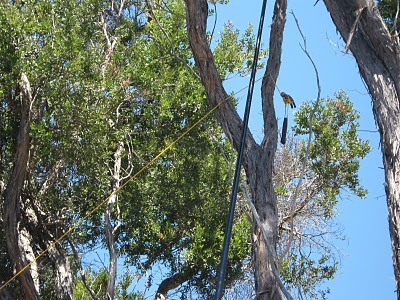 One was exposed with some stumps and the neighbouring area was lightly treed with some shade. This looked ideal for use as it gave room to set the squid pole as a loop or ground plane and gave Marcus a tree or two to set the 30m and 17m dipoles. 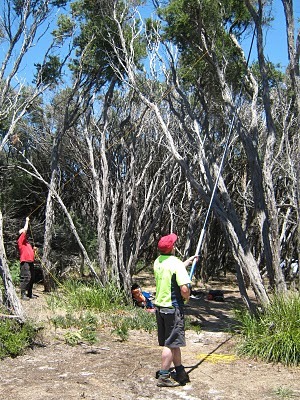 I started setting up the 20m quad loop and Marcus picked a suitable tree and started throwing my hammer up to try and get a rope over. After 4 or 5 attempts, a couple that got a little stuck, I gave it a try and got the hammer very stuck. After pulling the rope in a variety of directions it dawned on me that we could try using the squid pole to push the hammer out of its position. To Adam’s and the other campers amusement, I managed to get the hammer free and drop it down along with the rope ready for Marcus to hoist his dipoles in the air. I put the squid pole back on the stump and got the 20m quad loop ready for action. I made a contact into VK6 after just a couple of calls and this satisfied the award requirements. I then called CQ using VK3SAT and worked one other station on 20m. Marcus had got his antennas up and started setting up his FT-817 when he realised he had left the microphone at home. So we now had only 1 radio. So we were down two radios and the 40/80 dipole, had antennas in the air for 30m and 17m but no radio to work them, no SWR meter to help build an 80m antenna and only 3 instead of 5 batteries. Not the ideal start. However, on the positive side we did have 20m and 40m and the FT-7 was unlikely to flatten all 3 batteries in a weekend. I re-jigged the squid pole to be a 7 MHz 1/4 wave ground plane and we set about making some contacts on the 40m band. This proved to be the most productive band with 20 of our 22 contacts being made on 40m. I worked 40m and we moved around a little trying to keep out of the sun as best we could. Adam rigged my tent fly as a shelter and this blocked the sun for the few hours that we were exposed. None of our published skeds on 20m, 40m or 80m gave us contacts. There may have been stations waiting on 17m or 30m but without a radio to work them we weren’t there. We made contact twice with VI2AJ2010 on 40m before dark. In an attempt to keep our Saturday 80m sked I added some base load to the 1/4 wave 7 MHz antenna and gave it a try on 80m Without an SWR meter it was just an educated guess. We got one contact really quickly on 80m but that was it. Nobody else seemed to be able to hear us over their own noise. After calling and getting nowhere on 80m, and just after it got dark, we headed off to bed. Sleeping was uncomfortable as I had not taken a sleeping mat or pillow. In the morning 80m was a lot quieter but still no answers to our calls. 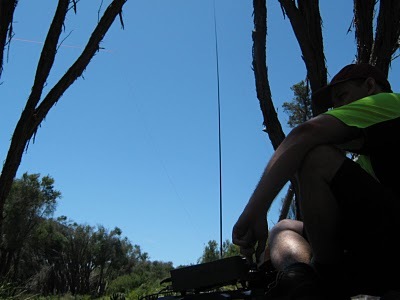 Again 40m proved to be a very useful band and we made 8 contacts on 40m for the morning. Just after 11:00 am we packed up and headed back to the ferry. We got to the jetty 5 minutes before the ferry was due and it was 10 minutes late anyway. 20 minutes later we were back on the mainland having achieved everything I set out to do, and more. However we had seen very few mosquitoes or flies and no snakes or koalas. We are all planning to come back sometime and see some more of the island, maybe on bicycles next time, and without the extra weight. This entry was posted in KRMNPA, SRESU. Bookmark the permalink. 3 Responses to French Island, The Keith Roget Memorial National Parks Award and a hike in the sun – it happened but not quite as planned. Sounds like great fun. Thanks for sharing your experiences. Perhaps next time you can work up a list of things to bring and use it as a check list as you (or your mate) do your final packing. I’ve left pieces behind, so I know how frustrating that can be.